If there’s one thing we’ve learned about our galaxy in the last 20 years or so, it’s that our solar system … isn’t that unusual. There are a lot of other stars out there, with a lot of other planets — even some that are a lot like Earth. Now, when astronomers refer to Earth-like worlds, they aren’t always saying that they have breathable air or liquid water or free wi-fi everywhere. What they mean is that it’s a terrestrial planet — rocky and close to Earth’s size, rather than a giant gas ball. And this week in the journal Nature, astronomers announced that they’d found another of these terrestrial planets — one that sets a new record: So far, it’s the closest terrestrial planet we’ve discovered orbiting a red dwarf star. Red dwarfs — also sometimes called M-dwarfs — are some of the smallest stars in the galaxy, with about 8 to 50 percent of the sun’s mass. But they’re also the most common — about 7 out of 10 stars in our galaxy are red dwarfs. So, researchers are interested in what kinds of planets orbit these stars, because they can tell us about a whole lot of the galaxy at once. This particular planet, dubbed GJ 1132b, is especially interesting to astronomers, because not only is it similar to Earth, it’s also close enough that we can check it out directly with telescopes at only 39 light-years away. The team discovered it while using a telescope array in Chile to monitor red dwarf stars for any dimming, which could mean a planet was passing in front of the star. Then, one night, 1132b’s star dimmed a little. After watching the star for a while, the team was able to come up with a spectrum, basically, a map of how the star’s light changed over time. By combining that spectrum with a set of equations, they figured out that the dimming came from a planet that’s a tiny bit bigger, a little more massive, and almost exactly the same density as Earth, meaning that it’s probably mostly rock and iron. That makes it the closest rocky, Earth-sized planet orbiting a red dwarf, at least that we’ve found so far. lead author Zachory Berta-Thompson of MIT said in a release. So this is definitely a very nearby solar neighborhood star. Artistic illustration of Gliese 1132 star system comparable to our solar system. 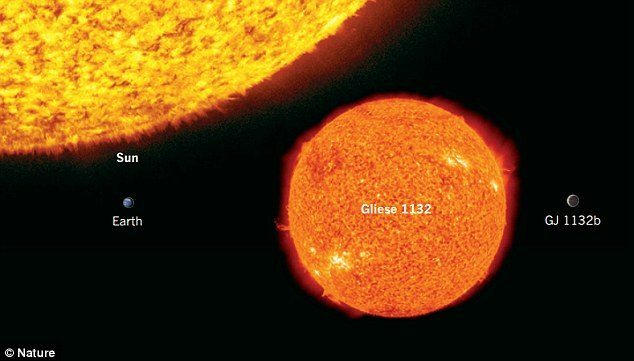 GJ1132b is around 16% larger than Earth but its star, Gliese 1132 is just a fifth of the size of our sun. © Nature. But, with only a 1.6 day orbit it gets around 19 times the radiation from its star than we do from ours. So, not exactly habitable by our standards. Its more like Venus in that respect: It is about 500° Fahrenheit. And the wi-fi signal there is probably weak at best. But it could have an atmosphere! And because it’s so close, and passes in front of its tar so often, we can study it and hopefully find out what that atmosphere is made of. said David Charbonneau of Harvard in a statement. We suspect it will have a Venus-like atmosphere too, and if it does we can’t wait to get a whiff. Meanwhile, astronomers are going to keep watching red dwarfs for signs of other planets — because there are probably more Earth-like worlds close by. We finally have a target to point our telescopes at, and [can] dig much deeper into the workings of a rocky exoplanet, and what makes it tick. The astronomers hope that further study of this new world, with the help of the James Webb Space Telecope, which has a 2018 launch date, will help to observe more characteristics of GJ 1132. Bottom line: The research team were able to discover the planet using the MEarth-South Observatory, which is in the mountains of Chile and is a Harvard University-led sequence of eight 40-centimeter-wide robotic telescopes.